Look Back at some of our most recent product enhancements and releases. When the season is in full swing, it can be easy to forget about a helpful feature that you read about a couple months back. Stay up to date with what we have released in recent months, and always stay current with every new feature we launch during the year. 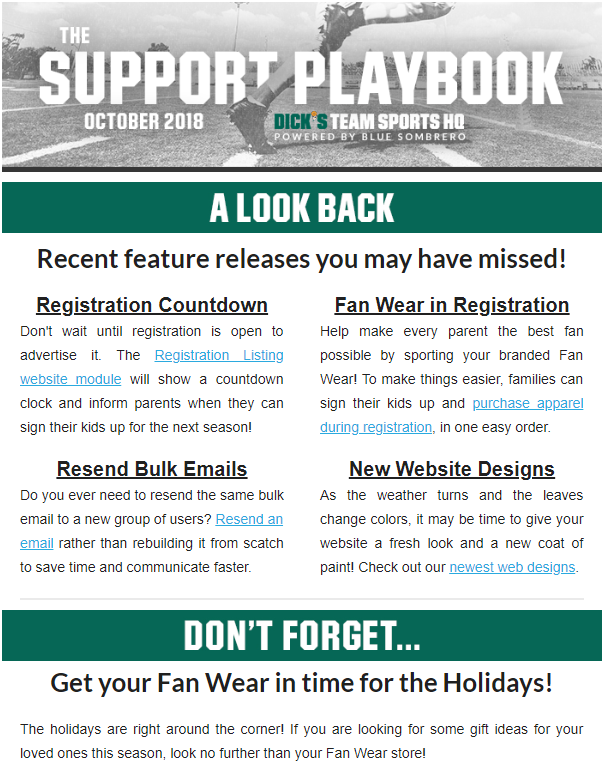 Don’t Forget…Fan Wear can be a popular gift idea for the holidays, but don’t leave it till the last minute! If you intend to buy some branded Fan Wear for a friend or loved one this holiday season, be aware that we can only guarantee delivery by Christmas up to a certain date. Market Your League through social media, but be sure to know which channel is best based on the types of content that you can realistically produce. We help walk you through the most well know social media channels and how they can best benefit a youth sports league.